Fifty-eight brewing scientists present time-tested solutions in an easy-to-read Q&A format. Includes 120 Cause-and-Effect Fishbone Diagrams to improve process control and product quality. 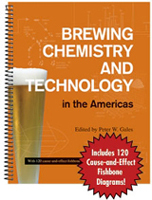 In Brewing Chemistry and Technology in the Americas 58 brewing science experts answer the “Who,” “What,” “How,” and “Why” of brewing chemistry. Like most scientific disciplines, brewing chemistry has become increasingly complex. Specialization of the scientists involved in various phases of brewing chemistry has increased to a level that it is often difficult for different sectors to communicate. This book provides a simple and easy-to-understand overview of the current science underlying the brewing processes and functions that exist across nearly any size operation. It will quickly build bridges of brewing chemistry knowledge among these specialists. What are the most important analytical tests for malt, and what ranges of values are generally found to be acceptable to brewers? Chapter 4 has the answers. How do various brewing materials compare on a cost basis? Chapter 5 shows you how. What new technologies have been used to rapidly identify brewery contaminants? Chapter 7 explains your options in this important area. Greg Casey’s 120 Cause-and-Effect Fishbone Diagrams add years of troubleshooting experience to your brewing operation. The second part of this book contains a powerful tool that will improve your brewing operation across all of its functions. As a brewing scientist, Greg Casey is renowned for his educational lectures on process control using his Cause-and-Effect Fishbone Diagrams. These diagrams are a visual way of representing the relationship between an “effect” of interest to a maltster or brewer (e.g., beer flavor stability) and observed “causes” influencing or correlating with the stated effect, e.g., time, temperature, total in package oxygen. Using the Fishbones provided in the book, a cross-functional team consisting of personnel from QA, R&D, Brewing support functions, plant management, and operations can capably troubleshoot a problem triggered by a loss in process control for a particular beer quality or processing productivity parameter. The Fishbones capture “Supply Chain Lessons in Improved Process Control for Product Quality Attributes and Plant Productivity Metrics” and have been developed over Greg Casey’s brewing science career. For the first time ever, these tools are available to all. Brewing Chemistry and Technology in the Americas? Bill of Materials, Oxygen & Trub! Assaying & Predicting Beer Flavor Stability: No Silver Bullet! Beer Flavor Stability Assays: Acronyms Gone Wild! Genetics of Flocculation: Go with the Flo! Malt & A Tale of Two Pentosans! Chillproofing: Tannoids 101 & PVP/PVPP!